I'm definitely one of those women that have a sweet tooth. I try to keep it to a limit when it comes to indulging in sweets, especially while being pregnant, but there are just some days where I give in and satisfy my craving for something chocolate or sweet. This pretty much occurs at night when I'm watching a movie or a show with the hubby or some times in the afternoon when while I'm working. So I was pretty excited when I got a great package from The Lovely Candy Company. The Lovely Candy Company has a variety of some of the best chewy candies I've had in a while. From chocolate to fruity sweets, they have it all. All of their candy is gluten and GMO free and also all natural. The Lovely Candy Company all started with Jackie asking her husband, Mike, to go on a quest for her favorite candy... licorice. Hers was a special request that it needed to be consciously crafted with select ingredients, gluten and gmo free. What started out with just licorice, evolved into additional flavors. I received six different flavors; the original caramels, chocolate swirl caramels, Fruit Chews, SuperFruit Chews, Raspberry Fudgee Rolls and Chocolate Fudgee Rolls. The only two I didn't get to try was their Cherry Licorice and their Chocolate Chews, which I can't wait to get my hands on. The first couple bags to go in my house were the Fruit Chews and SuperFruit Chews. My kids absolutely loved them. Each bag comes in three different flavors. The Fruit Chews came in Apple, Cherry and Blackberry and the SuperFruit Chews came in Blueberry, Cranberry and Raspberry. Let me just say these fruit chews smelled absolutely amazing and were just as good when we get to eat them. Both are made with real fruit and are all natural. I loved that while eating these delicious chewy candies we also got small bits of fruit in them, which was very enjoyable. Out of the non fruit chews, I have to say my favorite had to be the chocolate swirl caramel. Each piece was the perfect amount that satisfied my sweet tooth with both chocolate and caramel. Not only were these delicious, but they didn't stick to the roof of my mouth or on my teeth, like, some other caramel candies do. I also loved the Raspberry Fudgee Rolls as they had a delicious cream filling with bits of raspberry in them. Both chocolate and sweet, which worked out in my favor once the fruit chews were all gone. What I love about their chocolates is that there is no artificial ingredients or artificial colors in them along with no trans fat and no high fructose corn syrup. Knowing that and that they are gluten free, makes me feel a bit better when I want to treat myself to a piece of candy. You can purchase your own bag of delicious treats from your local Target or on their website. Be sure to also follow them on Facebook for more updated information about their candies. Disclosure: All opinions are my own. 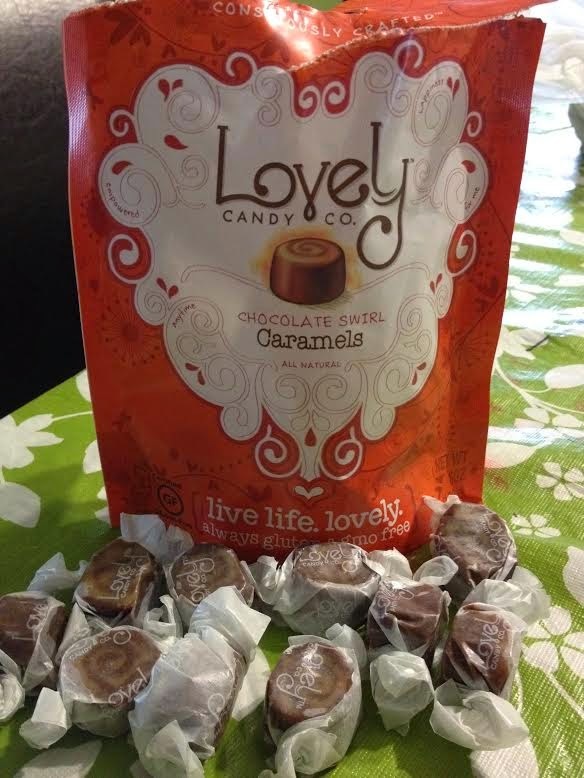 I received six bags of The Lovely Candy Company at no cost for the purpose of this review. No other compensation was received.